So you have decided to send fresh flowers for Valentines Day! I want to make sure your flower experience is a good one. First, lets get the tricky, yucky part out of the way. Determine you are indeed dealing with a real flower shop. There are fake flower shops out there, who act and might even LOOK like real florists. who will design your flowers. A significant portion of your money lands in the pocket of the service who was just a relay. Thats not your intention. At all. and pass it down the line for partial value. They want you to have lovely flowers with good value. Florists are paying more for flowers, too. Many times some flowers just come in extra lovely. A good florist can give you the scoop. If you want something long lasting, tell them! Maybe you just want a small floral token as an accessory to a weekend away. Florists are glad to assist no matter your budget. Flowers come from farms all over the world. They are cultivated, dependent on sunshine and environment. Nature has a say in the end result, without a doubt. Maybe the yellow roses are stunning, and the pinks are just average. 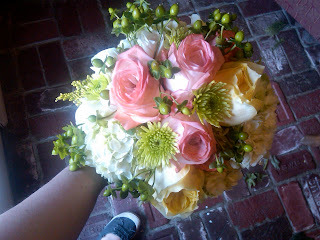 A good florist knows what is exceptional and can make suggestions accordingly. with “Looking forward to the weekend with YOU” on the card. Look like a hero to her friends a work. And let her enjoy the flowers before the big day. I’ll be in Colorado helping my friend Cherrie at her shop for Valentine’ Day. She is a great florist who loves her customers and flowers. More than likely, the florist you choose does, too. We could all use a little more color, love and fragrance in our lives, dont’cha think?